My reputation as a football fanatic has become something of a running joke. During my second year of law school, one interviewer asked why my grades were consistently lower in the fall than the spring. We spent the next forty minutes talking football, and I’m still convinced that if the entire US economy hadn’t collapsed two weeks later, I’d be working there still today. How I came to football is pretty self-evident. I grew up in Texas, where high school football fields are bigger than many college stadiums. And then I went to college at the University of Alabama, a place revered for football and reviled for its history and its role in civil rights struggles, past and present. What people find more surprising is that it was also my time in Alabama that turned me into a feminist. Early in my college career, I was lucky enough to find a mentor who encouraged me to question everything and who challenged me to stop accepting other people’s beliefs as my truths. It never mattered what conclusions I reached, so long as they were reasoned, and so long as they were mine. Give a girl a space to think for herself and watch her go! But if it’s this girl, don’t ask her to go anywhere on the Third Saturday in October. So, now, everyone’s talking about Michael Sam. And they should be. When the best defensive player in the best conference in college football announces “I’m an openly proud gay man,” just days before what amounts to the biggest job interview of his life, it means a lot of people are about to have their stereotypes handed back to them on a silver platter. Stereotypes both about what it means to be gay and what it means to be a football player. Sam has already disproven most of those stereotypes. He helped lead the Missouri Tigers to a 12-2 season, in their second season in the SEC, football’s most dominating conference. He racked up a resumé full of collegiate football honors. He was voted MVP by his teammates, all of whom knew about his sexuality. 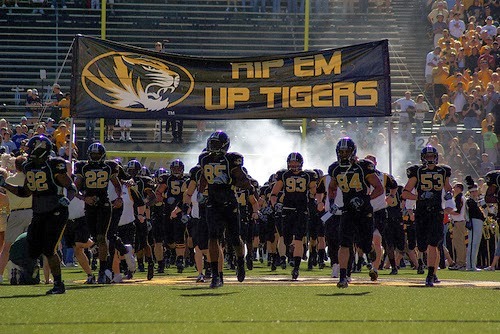 The sanctity of the Missouri locker room was, obviously, not compromised by the presence of a gay man in the showers. And while Sam acknowledged there might have been some “discomfort” among some of the less-enlightened team members, the real takeway is that everyone “worked through it” to build one of the most successful football teams in Mizzou history. I’ve also been asked a lot in the last week why I think Sam chose to come out publicly right before the Combine. The most likely answer is that it was going to happen anyways. Enough people involved in the draft process already suspected, and rather than waiting to be “outed,” Sam chose to come out in his own way. I admire the courage and integrity of that choice to take ownership of his own story, to not let anyone else dictate it for him. He is projected to be a mid-round draft pick. Whether the controversy causes his draft stock to fall (sadly, I think it will), he will be playing in the NFL next year. And he’ll do it on his own terms. The first openly gay player on the roster of any NFL team. But he won’t be the last. In all likelihood, he won’t even be the only openly gay player, at least not for long. I’m hoping that Sam’s courage and leadership will be the impetus for bringing other NFL players out of the closet. Rookies aren’t normally known for their leadership, but in this moment, Michael Sam has chosen to lead. In spite of the possible negative consequences it could have on his career, a very brave, very authentic 24-year-old man just did what no NFL veteran has had the courage to do. He’s taking the glare of the media and the speculation of the blogosphere and the intense scrutiny of the recruiting process all at the same time. And if he has the courage and strength to carry that load on his big shoulders, I can only hope by the time he takes the field, some NFL veterans will be ready to share his load. Marti McCaleb works in Seattle as a contract attorney and volunteers with Legal Voice. In August, after a 21 year wait, she’ll be the flower girl in her uncle’s wedding to the man of his dreams. She is having a difficult time finding a proper dress and welcomes suggestions. For the uninitiated, the NFL Scouting Combine is basically a week-long audition, where athletes perform physical and mental tests—yes, there are football aptitude tests!—and interview with various NFL scouts. It’s by invitation only, which means someone somewhere has to think you’re pretty good to even get in the door. A Super January for Law Geeks – and for Equality!